The hiking season for Mt. Kurikoma is from late May to early November. Trails are closed outside of this period and during the snow season, as it is extremely dangerous to hike on the mountain when it is covered with snow. There are 9 trails that lead to the summit of Mt. Kurikoma. Each trail has its own characteristics which allows you to choose the most suitable trail. 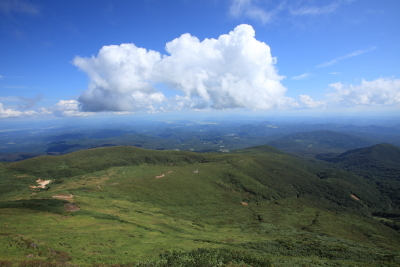 The easiest trails are Chuo and Sukawa trails. The ascent to the summit only takes 90 minutes from the starting point on these two trails to the summit. It is easy for beginner hikers, children, and families. These trails are taken by most of the hikers. 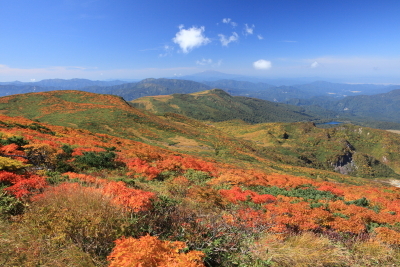 The Higashi Kurikoma trail is highly recommended for intermediate hikers. Not only it is a very enjoyable course, the trail also has many great sceneries. It takes about 2 hours from the starting point to the summit. All the other trails are for intermediate and advanced hikers. It takes approximately 4 to 6 hours to complete the hike on each of these trails, so we highly recommend hikers taking these trails to bring adequate water, food and equipment with them. Although Mt. 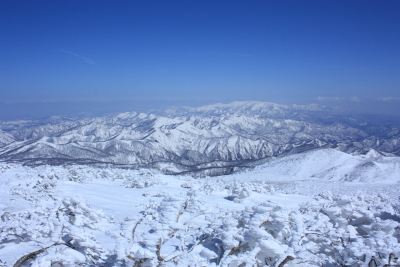 Kurikoma stands at only 1,626 meters (5,335 feet) tall, which is not that tall for a mountain, the weather condition is similar to areas with an altitude of 2,500 meters (8,202 feet) such as the Japan Alps, due to the mountain’s location in the temperate zone. The wind generally is very gusty in the mountains. At times when there are strong wind, the apparent temperature can be much lower than the actual temperature. (Approximately -1.0℃ per 1 m/sec of wind velocity). In summer, there are frequent occurrence of dense fog and thunderstorms, increasing the risks of hikers losing their way. If you hear the sound of thunder, stop whatever you are doing and take shelter in a safe place immediately. You must carry rainwear, warm clothing, a head lamp and a map. You should check your equipment before departing for the hike. When you hike Mt. 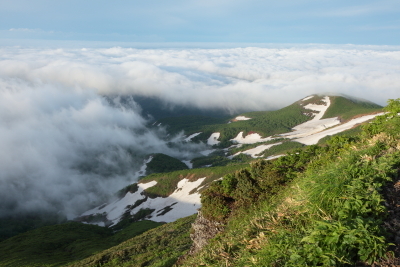 Kurikoma, you should be adequately equipped when climbing at an altitude 1,500 meters or higher, so that you can cope with any sudden weather changes or unexpected delays in descending the mountain. *Mountain trails and other facilities are typically open from June to October.